It’s early. The sun begins to brush a streak of pale golden-peach along the horizon. I can hear a variety of birds greeting another dawn. This is a special time. Serene. All mine. For a little while I will ignore my plans and duties of the day, think of nothing and enjoy the show that will soon begin. Before I sit, I pull the French door curtains aside. There is a Hummingbird feeder in my garden, just a few feet out from the French doors. I wait, concentrating on that spot. The actors seem to know when I’ve taken my seat and arrive on cue. Three miniature birds rocket into view, twist, turn, plunge, dart, then rapidly ascend before repeating their actions in an attempt to claim the feeder as their personal territory. I don’t understand how all the frenzied flying, at speeds from 30 to 60 miles per hour, can make me mellow. But it does that and better–it makes me smile. Beside me, shadows begin darting behind the curtains next to my desk. Slowly, so I won’t frighten them, I make a small opening between the panels. There are three more tiny projectiles maneuvering in similar patterns around the new feeder, which was added last week. It’s only 18” from the window, so I’m front row center for every show. I part the curtain more, and a female comes within an inch of the pane to peek in at me. Two more Thumbelinas join her, and I can hear the bumble bee buzz of their rapidly beating wings through the windowpane. They are minute avian helicopters, hovering in fixed position. Sometimes, like now, I am very briefly an audience participant in the morning play. It’s because I’m wearing a bright red sleep T-shirt, and they can see me clearly; red is the favored color. The three Hums hang at different heights, close to the glass, deciding if I might be a tasty flower. 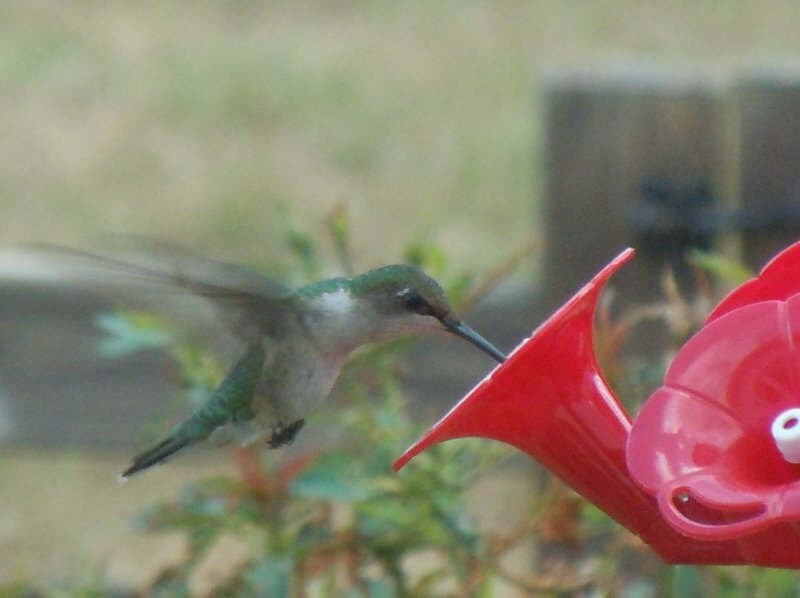 I never pass the flower test, so they return to chasing each other and landing briefly on the feeder to sip the nectar I’ve made for them. Now and then they investigate again, checking once more to assure themselves that I am not a viable breakfast. As I enjoy their chaotic air show and find myself relaxing, it suddenly occurs to me why I might be so attracted to them — they’re similar to me in several ways. They’re content with being solitary and are independent, curious about everything, usually in a busy tizzy, and they take a lot of short breaks to perch and revive. They’re also aggressive, which I can be when absolutely necessary. My comparison comes to an abrupt halt as I hear movement on the other side of the house. It’s time to start my routine and discover whether I’ll be challenging or embracing the surprises of the day.